Walking in through the front door was the first shock that I received that afternoon. I had just entered, what seemed to me, an entirely different world. Waiters and waitresses weaved their ways swiftly between the maze of chairs the main dining room presented. Decorations and ornaments littered the walls with everything from vintage rock posters to professional sports jerseys to placards that stated celebrities who once dined at Bartley's. Despite the non-vacant state of the restaurant, we were seated immediately by the staff in what may have been the tightest yet one of the coziest burger table setups that in which I have ever sat. My party of seven huddled around a wooden table in the back corner. However, we soon forgot about our tight seating situation as soon as the food was served. Spencer, Mr. Bishop, and Maksim all got a Bartley's frappe before being served our main course. Onion rings were ordered for the table as an appetizer. Mr. Bishop described the onion rings (onion strings?) by saying, "I like them because they are extremely simple... You don't have to put ketchup, or salt, or vinegar, or anything like that. They generally seem that they would be a nice accouterment to anything that you are eating." Spencer Akers thoroughly enjoyed his "strawberry shortcake" frappe, describing it as "Division one, high quality. It's not too thick, but it's not too thin either." Our main entrees were served within fifteen to twenty minutes of the time that we had ordered it. I ordered the "Tom Brady - The 40 is the new 30" burger which had cheddar, guacamole, lettuce, tomato and red onions with fries. Spencer also ordered the "Tom Brady," but without the guacamole and red onions. He thought that the meal was delicious with his only complaint wishing that the portions had been slightly more substantial. 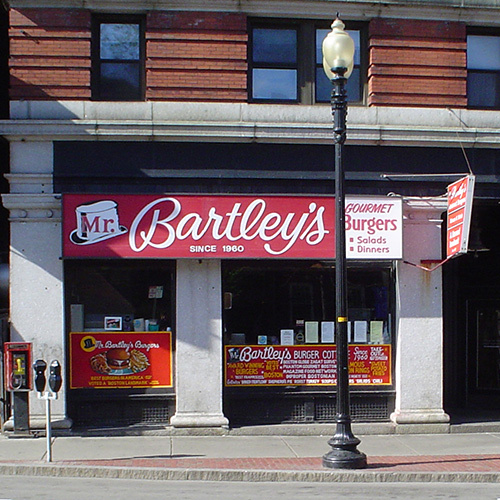 Personally, I felt that the burger was the perfect size to eat alongside a milkshake as it is almost signature to get a frappe when you dine at Bartley's. Mr. Gotlib got the Bernie Sanders burger which had feta cheese, pickled red onions, and grilled peppers with sweet potato fries and thoroughly enjoyed the balance between the burger and the condiments. However, Gotlib felt that the sweet potatoes fries were a little heavy and a bit too filling. In contrast to other orders and what you might expect, Mr. Bishop got "Franks and Beans" as he was searching for something a little different. "It's awesome when restaurants can do the simple things well," says Bishop. Maksim ordered the "Julian Edelman" with bacon, American cheese, BBQ sauce, Cole slaw, and guacamole with onion rings. 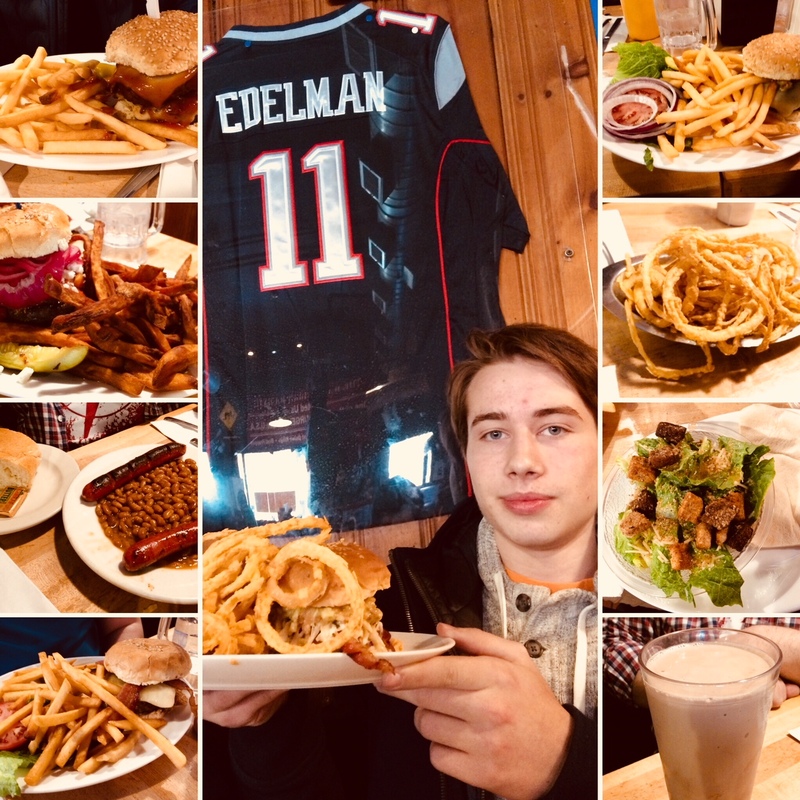 Maksim thoroughly enjoyed how the burger was cooked and felt that the burger was fitting for the fact that he was seated in the same spot where the famous Patriots football player Eddleman had eaten when he visited Harvard Square. "I almost felt a connection by sitting where he sat and ate what he ate," joked the Muscovite. The last but certainly not least burger that was delivered to the table was the "Yuuggee Trump Tower" burger consisting of a double patty with a double burger with cheddar cheese and BBQ sauce served with fries. There were doubts that because of the size of this burger, Viraz would have a tough time eating it all. However, Viraz ended up devouring the burger until nothing was left except for a few sesame seeds at the bottom of the plate. "I don't think the menu's description of 'yuuggee' fully described the gargantuan proportion of the Trump Tower. "